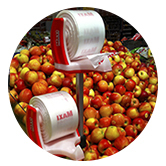 Read more about the advantages of the Ingemann packaging solutions. 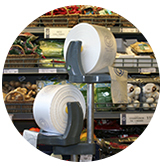 C-folded plastic bags on rolls for the retail market. 100% virgin HDPE with exceptional strong properties. Different sizes or thicknesses and with or without print. Danish design and manufacture, molded in on piece for extra strength and durability, available in bright and strong colors. 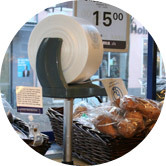 The Ingemann / Unisold holders consist of a large variety of options to easily set up the system in any food retail store. 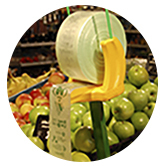 The holders consist of light weight yet strong materials such as Aluminum and Polypropylene. On May 14-15, Ingemann will participate in an Innovation Lab taking place at UN City in Copenhagen. It’s the next step in the Innovation Journey of the SDG Accelerator programme we are a part of. At the Innovation Lab, the 15 participating companies will conceptualise ideas into actionable concepts, plans and solutions based on global expertise from UNDP, Deloitte, academia and other subject experts. Euroshop 2017 - 5th - 9th of March. Ingemann Packaging will exhibit at this year´s most important event for shopfitting equipment and packaging. Make sure to visit us in the new Hall 18, stand no. C09.